Taco Maria’s chef and owner, Carlos Salgado, was named as a finalist for the James Beard award for his work at Taco Maria, and Jonathan Gold has called it one of the best restaurants in SoCal, for good reason: dinner is a prix-fixe four-course menu that rotates on a regular basis, depending what Salgado finds fresh, so the menu’s always unique -- and always delicious. Previous tasting menus have included dishes like the “Pozole de Abulon,” (a delicately constructed soup made with abalone, beef tendon, clams, hominy, turnip, and lime) and “Tocino con Chicharos,” a bean dish laden with pretty much the best bacon you have ever had. 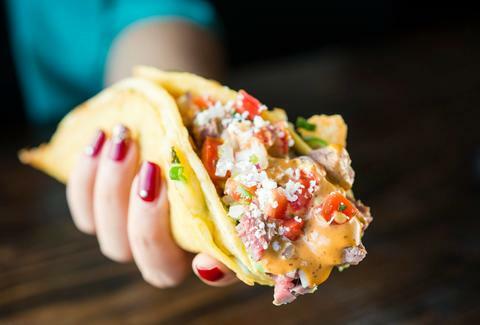 There’s sort of no question: Taco Maria is the premiere Mexican restaurant in Orange County. Locals flock to the loud, colorful Carnitas Uruapan for authentic Michoacán-style pork carnitas suritida, made with the whole-hog -- skin, belly, intestine, and all. This restaurant pays homage to the pig, with colorful piggy murals on the wall, and if you’re lucky, you will come face to face with your dinner as they roll out the freshly cooked whole pig from the kitchen to the steam tables. Wash the bold flavors down with free consommé, then count down the moments until you get to pig out again. 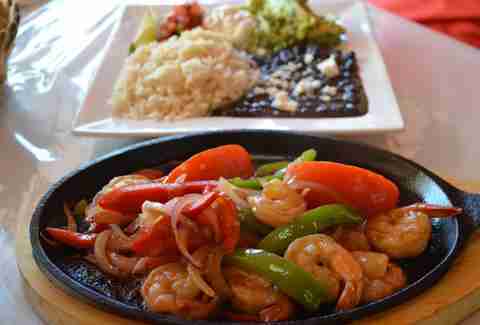 Located in the historic Orange Circle, the patio-abetted Gabbi's provides a mix of traditional Mexican recipes with Americanized culinary techniques. 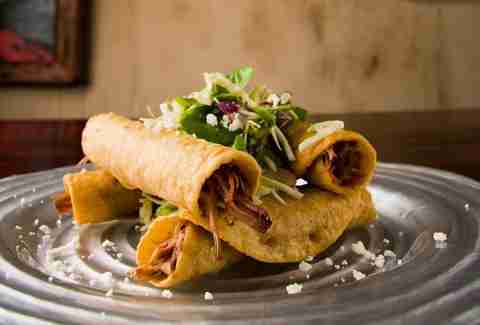 Gabbi's uses fresh ingredients from local farms in their modern Mexican recipes, which includes sweet, buttery, plump Enchiladas de Camarones -- shrimp enchiladas stuffed with buttery sautéed spinach and white Mexican cheese, wrapped in crepe-ish thin tortillas. This Gringo-style Mexican restaurant has not changed much since it opened in 1965 and still preserves its Bonanza-esque exterior and outdated interior. It’s a dive restaurant, for sure, but their cheese-laden dishes (and dirt-cheap prices) have made it a local favorite for years (Gwen Stefani name-checks it as one of her faves). Most combo plates, like the enchilada and taco combo, only cost $5.50, and you can get a sangria for under $2; it may not be the most authentic restaurant in OC, but the food is great -- and will leave your wallet mostly undented. SOL Cocina offers the fresh, seafoody flavors of Baja Mexico in an upscale Newport Beach setting overlooking the marina. 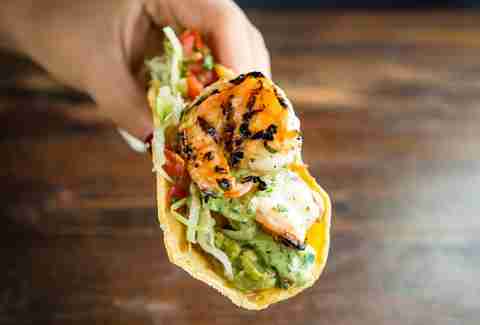 The “Mexican shrimp al mojo de ajo” has intense flavors of white wine and butter, and their “Viper Taco” is spicy and dynamic in flavor, made with grilled chicken and muy caliente ghost peppers. SOL attracts the Desperate Housewives of Orange County crowd on the weekend, so they’re primed for many, many orders of organic slim margaritas. El Fortin is small, cramped, and full of crickets. Yep, that’s right -- one of the restaurant’s most popular dishes is chapulines, the Mexican word for crickets, which are a delicacy in many parts of Mexico, including Oaxaca, the owner’s home state. At El Fortin, you can order the creatures, simply roasted with lime, salt, and garlic or in their chile relleno and quesadillas. Although the restaurant is best known for the chapulines, they also do a very steady business with their mole and molletes. The former '80s fast-food chain Naugles was swallowed up by Del Taco back in the day -- and has risen from the dead in Huntington Beach. Core Naugles fans are zealots and some have have driven cross-country to rekindle memories of their younger days. Naugles opened their first new restaurant in Huntington Beach in June (after a couple months of pop-up style test-kitchen dinners), and they have since been flooded with loyal fans. “The Hombre” is a gut-buster burrito, made with with a full pound of beef, beans, cheese, and your choice of green or red sauce; they’ve also got a sloppy joe-ish “bun taco”, which takes the contents of a taco and puts it between two hamburger buns. Tacos Ensenadas is one of OC’s great hidden-treasure Mexican spots, with some killer seafood in an unassuming interior. Their mixto ceviche tostadas are very popular, as is the fried tilapia, but if you are only getting one dish, make it the “Coctel De Campechana” -- a seafood cocktail with shrimp, abalone, and octopus. Don't confuse El Toro Bravo for the other Mexican restaurant facing the street in the same center -- rather, head to the back and look for the line going out the door. The meat is the star of this restaurant, and it rotates on a daily basis, with standbys like chicken and beef also abetted by funky choices like rib meat, buche (stomach), and trotters. After you select your meats, they chop it up in front of you and serve it with rice, beans, salsa, chips, and a stack of house made tortillas in foil, which are perfect for make-your-own-taco Tuesdays. Taqueria De Anda is a Santa Ana institution, which started as a food truck and has evolved to several restaurants throughout OC. The restaurants are still operated by the same family and the recipes have stayed true to their humble beginnings. De Anda is best known for the pastor tacos, with meat that is slow stewed and then broiled with fresh onions, integrating the flavors into a beautiful, layered flavor experience. Set in the rustic Trabuco Canyon, Rose Canyon restaurant feels like a secret spot you stumbled into a hacienda in the foothills of Mexico -- the food is good, but the atmosphere is the real draw. Request a table on their patio and you will be rewarded with views of oak trees and the sounds of nature. The steak in their fajitas is extra-juicy and the crispy caramelized flavors from the steak and onions sticking to the hot pan adds a nice flavor boost. Added (sorta) bonus: if you own a horse, you can feel free to park him at the front-door hitching post. This legit taqueria is located in the heart of Santa Ana, and is worth visiting for their carnitas tacos, which are made with handmade tortillas, and are full of juicy pork with just the right amount of fat to make the flavors pop. 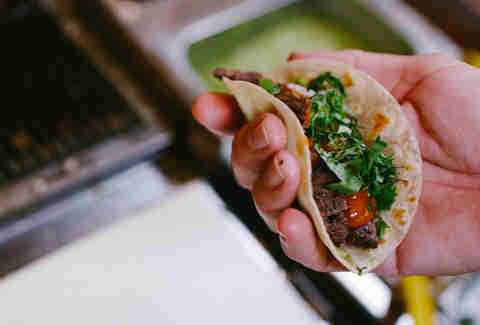 If you’re adventurous, try the cabeza tacos; the fatty head meat literally melts in your mouth as your chew. Top these tacos with their house-made salsas and wash it all down with their cucumber agua fresca. Garden Grove’s known more for Asian flavors like pho and Korean BBQ, but don’t be fooled: it’s also home to one of the best Mexican restaurants in north OC. Sabroso is a sit-down family restaurant with food that’s not the fanciest -- but with recipes that have passed down through generations. The DDD-approved spot’s best dish is the "Chamorro" -- a tender chuck beef slow simmered in a dark brown (almost black) deeply smoky Guajillo sauce. Los Reyes attracts long lines of loyal fans for boiled or chargrilled corn covered in mayo, Cotija cheese, chile, mantequilla, chili powder, and, of course butter. For $3 you can get an ear of their loaded corn -- or for a dollar more, you can get it “lazy style” served in a cup. 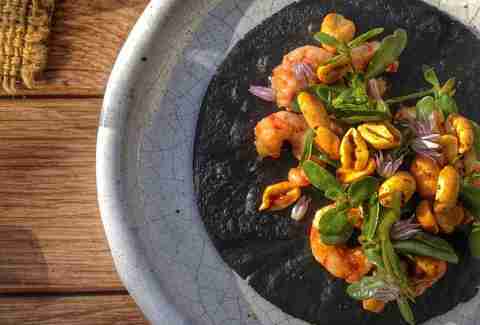 They’ve also got the sometimes-hard-to-find specialty huitlacoche, essentially enormous corn kernels that have been infected with fungus, giving the corn a mild truffle flavor. Some folks will say that you can’t find OG Tijuana-style carne asada tacos in Orange County. Those folks are wrong. Tio Flacos makes carne asada that is hugged by smoky hardwood flavors, and just like in TJ, the meat is put on the hot mesquite grill as you order, ensuring it comes out hot, with the natural beef juices still oozing out. Very little is pre-made, as they also freshly press and cook their tortillas throughout the day. Tom Holmberg is a freelance writer for Thrillist. You will often see Tom debating the finer points of crispy carnitas, while hoarding all the chips and salsa at the table. Follow Tom on Instagram and Twitter @tomsfoodieblog.